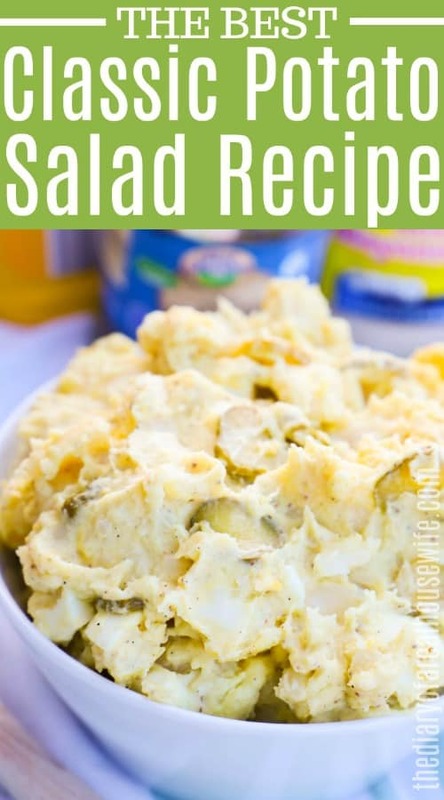 This recipe was passed down from my mother and my all time favorite potato salad recipe. 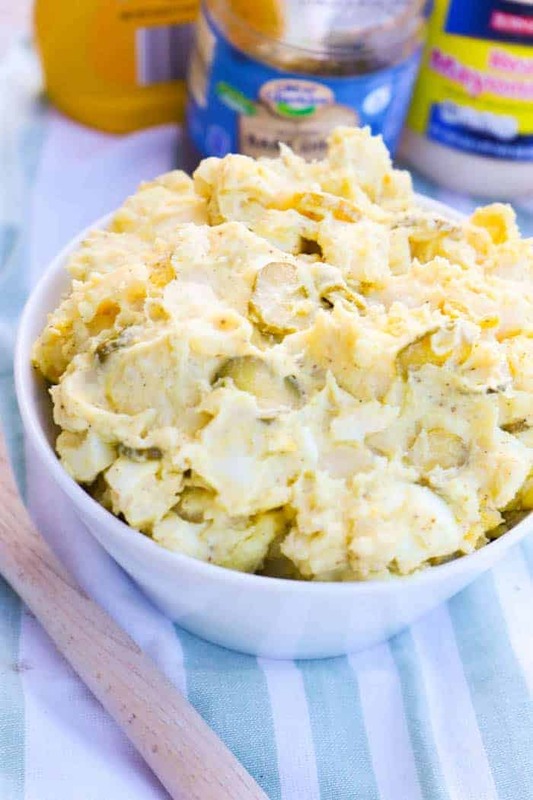 This Classic Potato Salad will need to be at your next grill out or picnic! This recipe is a classic that was passed on to me by my mother. She came to visit me during her spring break and we grilled burgers, sliced up watermelon, and served this Classic Potato Salad. This recipe isn’t just for a picnic and a summer table though! We actually serve this with our Christmas meal each year. It was my Granny’s favorite so we served it instead of mashed potatoes on the side of ham, deviled eggs, and broccoli casserole. No matter the setting this recipe is a classic that you are going to love. Step one: Start by preparing your potatoes. I washed then peeled and diced my potatoes into bite-size pieces. Place potatoes in a large pot and cover with water. Boil until potatoes are fork tender. Time will depend on how small your potato pieces are. Once cooked drain and place in a large mixing bowl. Step two: In mixing bowl with cooked potatoes add mayonnaise, yellow mustard, diced pickles, celery seed, and eggs. Gently fold together until well combined. Add salt and pepper and again gently fold until mixed in. You want to be careful mixing your warm cooked potatoes. You want to try and keep chunks and not turn them into mashed potatoes. Step three: Serve warm or keep in the fridge to serve chilled later. Peel and dice potatoes into bite size pieces. Place potatoes in a large pot and cover with water. Boil until potatoes are fork tender. Time will depend on how small your potato pieces are. Once cooked drain and place in a large mixing bowl. 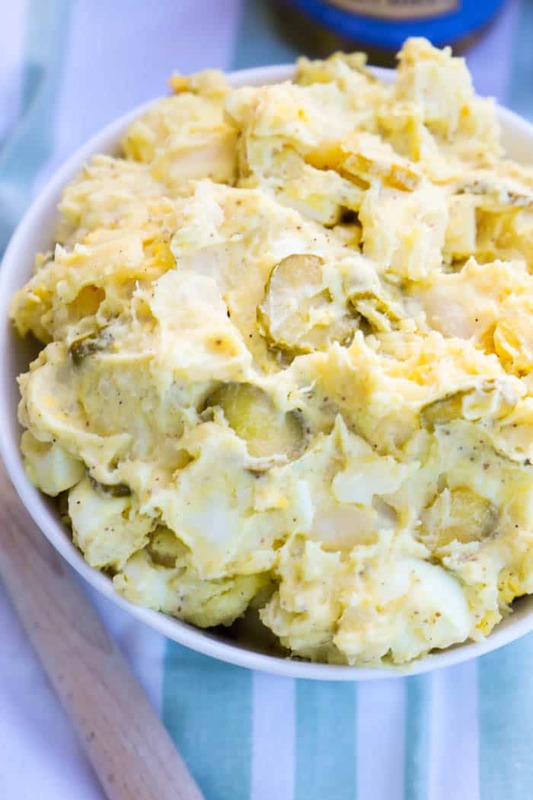 In mixing bowl with cooked potatoes add mayonnaise, yellow mustard, diced pickles, celery seed, and eggs. Gently fold together until well combined. Add salt and pepper and again gently fold until mixed in. Serve warm or keep in the fridge to serve chilled later. I hope you can answer this question for me. Why is it that my potato salad gets watery when I serve it the next day? Sorry that happened to you Karen! I usually do not have an issue with this recipe but since potatoes contain so much water I see how that could happen. Next time you make it try getting any water out of the potato first. I know some who will shred their potatoes and then squeeze the water out (Here is a video: https://www.youtube.com/watch?v=Xa2O0-0J_8o). If you don’t want that extra work then I would say drain the water the next day and mix until it’s all gone! Hope that helps Karen!